When I was first asked to create a license tag for West Virginia, I knew that I wanted to represent the land somehow, and the way West Virginians feel about our home state. (We love it here!) I also really wanted it to look like it could be used as a license plate, if an especially “quilty” one. I kept it simple with English paper pieced hexagons, easy applique and hand embroidery. Also, West Virginia has had kind of a rough time of it lately (did you hear about our water crisis? ), so I added a little rainbow-ish border to represent better days ahead. When this plate is stitched into the quilt with the others, it’ll have a thin band of color all around it. 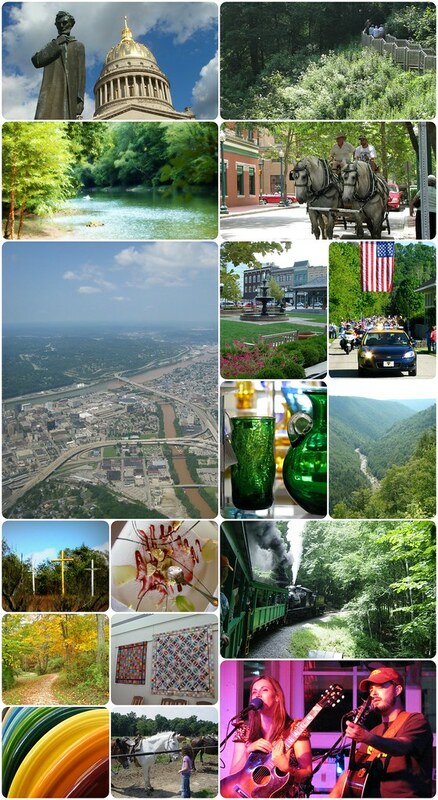 For your viewing pleasure, here are a few of my favorite things from around West Virginia. You may recognize Fiestaware and Blenko Glass, two West Virginia companies whose products I see in my own home and from coast to coast whenever I travel. American Made Brand is giving away a set of eight fat quarters just to thank you for visiting this blog! To enter, just leave a comment by Sunday evening at midnight (Eastern), June 15. (If you comment before I get up Monday morning, I’ll probably leave you in the running, but I do get up awfully darn early and I don’t want you to miss out.) If you have no idea what to say, just tell me what state you’re from. Actually, this is open to anyone around the world, but if you’re not in the USA they’ll ship to me and I’ll ship to you, so please be patient with us and allow a little time if that’s the case. These are wonderful fabrics, so please enter and get a chance to try them for free! I was also told that I could give away the leftover fabric once I created my license plate. As a quilter though, I’m used to making something out of the fabric first, then giving it away. So I made placemats (following this tutorial) and a friend of mine is going to deliver them on her regular route with Meals On Wheels. Giving the fabric away as placemats to people receiving meals seemed like an especially appropriate way to share American Made Brand fabrics. I just picture all the Americans involved in the creation of this fabric, from the farmers to the weavers, dyers and even the truck drivers making sure it all gets where it’s going — surely they’d all be happy to know they helped put a smile on an elderly someone’s face, along with good food in their belly. And placemats are a great way to show off more of the colors in the American Made Brand spectrum, aren’t they? So, be sure to comment below for a chance to win eight fat quarters of American Made Brand fabrics, and check back tomorrow if you’d like instructions to make a West Virginia plate of your own! Update: Giveaway has now ended. Nice block! Hexis are so intimidating to me. When I saw WV on the list, all I could think of was the water crisis. I work on the drinking water field, and what you experienced is basically our worst nightmare. Very unfortunate for you but know that Californians are sympathetic. At work, we are using your experience as a learning opportunity, and hope it never has to happen again. I’m originally from Tennessee, but have lived in Florida for over 40 years, so I call Florida my home. I’m sure those placemats were enjoyed, thanks for being so caring. I’ve only driven through WV once, but I thought it was beautiful! Sarah, your placemats are very pretty and ingenious. I love that they will go to the elderly who receive Meals on Wheels. I also love our license plate. Making the state map must have been interesting! Your hexagon background is perfect–I wish I had thought of that! Great idea to make the background from hexies. 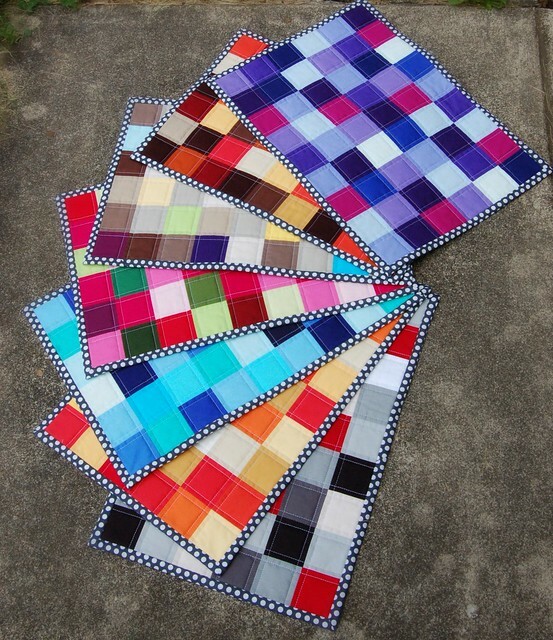 Your block is great and placemats are such a great idea from the leftover pieces of fabric. 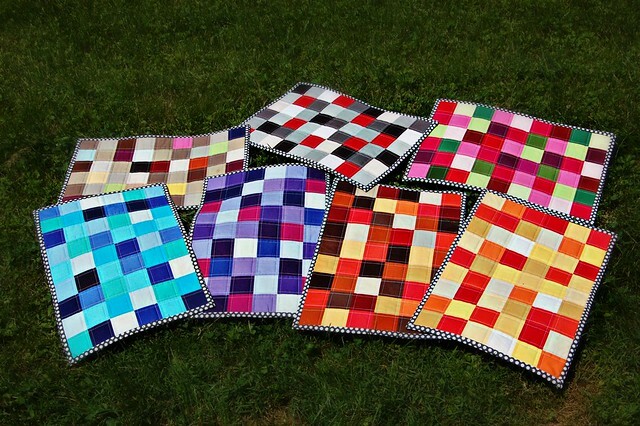 Love the your block and what a great idea for the leftover fabric, placemats! Very nice block! Would love to win the giveaway. I love your license plate and the terrific placemats! I love the license plate and the placemats are awesome! I love that you used hexies in the background! Love your use of hexagons in the license!! Love your license plate, I EPP also! You are so very thoughtful making the placemats and giving them away with MOW, they will be loved. 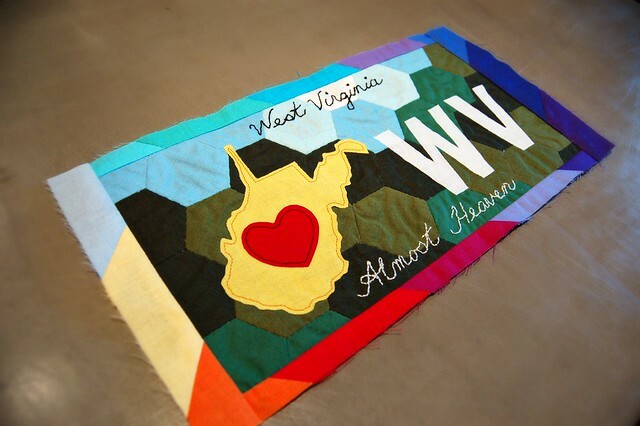 The hexies used in the design of the WV license plate are so now. What a clever idea. WV is one of the 15 US states I have left to visit so it is on my list. The placemats are a great idea, I may sew a couple of them today. 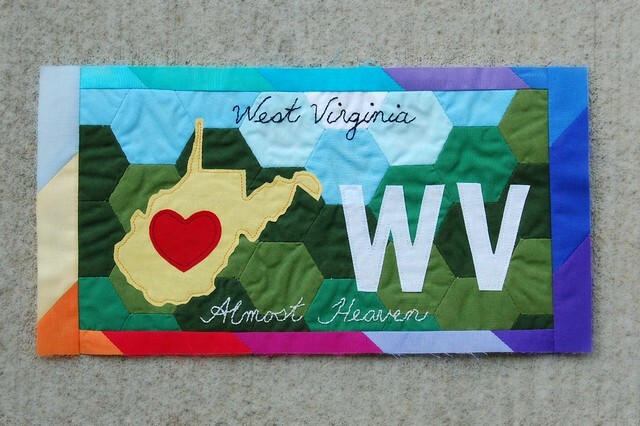 The hexies used in the WV license plate are so now. Wv is one of 15 states I have left to visit on my 50 US state tour. I have added the placemats to my list of things to do. They are a great idea. What a beautiful block. And very thoughtful way to use the scraps. I live just south of you in VA, and we share your horror at the water crisis and hope it’s a wake-up call for better safeguards. Thanks for the nice photo tour. Sarah, Your block is so fun! LOVE the pieced border, the idea of embroidering with the paper in place (never thought of that!) and the meals on wheels extra-special giveaway – dear to my heart. Thanks so much for participating in the blog tour! Love the placemat idea. Nice license plate!